Native American Coastel Miwok people were living in Mill Valley at least 6,000 years ago; 14 Miwok village sites have been identified in Mill Valley. The coastal regions of California, including Marin County, were claimed by Spain in 1769, and then by Mexico in 1822. The Spanish did little to colonize California but set up 21 Catholic missions and outposts between 1769 and 1833. The missions were built to civilize the native people, and also imported diseases that killed most of the native population. The San Rafael Mission was established as a hospital for the few surviving Miwok people. Mexico granted large blocks of land, or Ranchos, including present day Mill Valley, to two settlers, John Reed in 1834 and William Richardson in 1836. The Reed land was named appropriately Rancho Corte Madera del Presidio, as Reed set up a saw mill on Cascade Creek (in Cascade Canyon) to cut and process the redwoods and deliver them to San Francisco to build the Presidio. Reed also had dairy farms on his land. California was ceded to the US in 1848. Mill Valley remained small though the 19th century, with about 900 residents in 1900, when the city was incorporated. After the 1906 San Francisco earthquake, the population began to grow and the present town developed. You can find interesting histories of Mill Valley on the Internet; for example, at the Mill Valley Historical Society and Wikipedia sites. The City of Mill Valley is home to about 14,000 people with 6,500 households. Unincorporated Mill Valley adds another 10,000 residents. The population is about 86% white, 5% Asian, 5% Hispanic, and 1% African-American. The median household income in 2016 was about $154,600. 73% of residents 25 years and older have a bachelor’s degree of higher, about twice the California and national levels. Cost of living in Mill Valley is estimated at 277 relative to 100 for the nation and 137 for California. 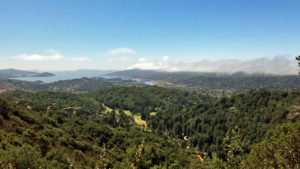 Mill Valley has a mild climate with cool, wet winters from November through April, and dry, warm summers. Summer coastal fog often cools the area at night and in the morning, clearing in the afternoon. In general, Mill Valley has more foggy and overcast days than other parts of Marin. The cool, foggy days support the growth of redwood trees that contribute to the city’s charm. Marin Transit Route 7, travels from the San Rafael Transit Center and the Larkspur Ferry Terminal to the Sausalito Ferry Terminal, with a stop in downtown Mill Valley. Marin Transit Route 61 provides service from Tamalpais High School to Muir and Stinson Beach, and Bolinas. Golden Gate Transit Route 4 provides service between downtown and the San Francisco Financial District and Moscone Center. This route may eventually link to the new Transbay Terminal in San Francisco. Mill Valley is a suburban, commuter neighborhood with a high percentage of highly educated, high income residents. The local economy is focused on services. Mill Valley City Information: Parks, schools, city news, and happening. Mill Valley Library near downtown provides a rich array of classes for all ages, art exhibits, lectures, podcasts, a dedicated Mill Valley History room, and more. Mill Valley Parks: Mill Valley is blessed with breathtaking outdoor space for young and old alike. Residents are spoiled by the natural, wooded environment. Mill Valley Municipal Golf Course is a 9-hole par 33 (par 32 for back nine) course set on 42 acres of hills, creeks, and redwoods. Mill Valley Community Center provides reception and meeting rooms, an indoor swimming pool, special event spaces, and playing fields. Homestead Valley Community Association and Land Trust. The Homestead Valley Community Center provides special community gatherings and celebrations, pool membership, summer camp, and party rentals. The Land Trust oversees 80 acres of open space and trails in the valley. Muir Woods Park Community Association: The community center at 40 Ridge Road off of Panoramic Highway provides a center for community activities and private parties and meetings for up to 75 people. Tamalpais Community Services District. Provides the garbage and sewer system for Tam Valley and manages parks and recreation. The Tamalpais Improvement Club includes a community center and event location for up to 192 people. Redwoods Senior Living Center on Camino Alto provides high quality residential living and services for seniors. Strawberry Recreation District operates Strawberry recreation community center, athletic facilities, and parks, including tennis courts, a swimming pool, and playing fields. The Mill Valley Police Department and Fire Department serve incorporated Mill Valley. Unincorporated Mill valley is served by the Marin Country Sheriff or the California Highway Patrol and the Southern Marin Fire Protection District. If you need help, just call 911.